As a student, I always regarded history as boring and impersonal, but as I read Wolf Hall by Hilary Mantel, I was dumbstruck with the sheer impression history can make. Hilary Mantel has very wisely chosen a stormy period in Tudor History, and has successfully created a wonderful story, by presenting the real life characters through the imaginative eyes of Thomas Cromwell. Wolf Hall is not just a story written in ink, it is a saga etched in blood. A story that flows with emotions, surged with sentimental flood. But, of course one needs a powerful story teller to recreate the dramatic past. And, Hilary Mantel does succeed partially to transport the readers into the long bygone era, with reality and imagination walking hand in hand. The story of Wolf Hall revolves around the events of 1530s in England, when Henry VIII decides to annul his first marriage to Katherine of Aragon, widow of his elder brother. However, Henry finds it quite difficult to get rid of the twenty years old wedlock, as the Pope refuses to assist him in declaring his first marriage illegitimate. Henry’s Lord Chancellor Wolsey, who is an intelligent, worldly wise man fails to secure divorce for the king and thus earns Henry and Anne Boleyn’s ire. Anne Boleyn is Henry’s current flame and he is adamant on marrying her at any costs. As Wolsey is unable to assist Henry in his present adventure, he loses favor and is dethroned from his coveted position and forced to leave the York Palace. Wolsey’s enemies Stephen Gardiner and Thomas More climb up the ladder. One is crowned the Lord Chancellor, whereas the other secures himself as Master Secretary. And, then begins the era of senseless cruelty, so called religious reforms and brutal assault on Tyndale supporters, adversely affecting Henry’s popularity as a benevolent king. However, Henry is lucky to find a worthy well wisher in such trying times. Unknown to everyone, an assistant of Wolsey, a trusted lawyer, a favored nobody, Thomas Cromwell comes into prominence. Cromwell is a political conniver, a lady charmer and a calculating diplomat. While everyone expected him to vanish with Wolsey, he surprisingly enters into the good books of King Henry and Lady Anne, gaining free entry into their palaces and hearts. Steadily, Thomas Cromwell, the protagonist of this story of Henry’s desires, secures a center position. All of a sudden, he is everywhere, working out the intricacies of divorce and complex arrangements of second marriage, handling State Finances and securing Papal Decrees. And, strangely, the main motive of Henry’s second marriage is to get a son, a successor, who would be able to revert the Civil Wars and ensure Tudor Dynasty’s stronghold on English crown. Till I read Wolf Hall, I felt only Indians are crazy about son, considering the failure to produce one, a curse for the family. However, the present novel opened my eyes to the absurdities prevalent in Tudor England,where a Civil War is eminent, if Henry VIII does not beget a son. There are of course, the lust and desires of King at play too, but predominantly, it is his zeal to produce a male heir, that forms the basic frame of the story. As the novel progressed, Thomas Cromwell becomes Henry’s sole hope, a master conjurer, who would annul his first marriage, declare him Head of Church and give a legitimate status to his wedlock with Anne. However, whether Henry would ever beget a son, is a question, that is beyond the capabilities of even Thomas Cromwell. And the novel tethers on it for quite some time. And, in between the story oscillates from religious riots to fake prophets to burning of heretics, creating a heady atmosphere for Hilary Mantel to work upon. So, in essence, the novel, though based upon the history of Tudor England, is actually dominated by Thomas Cromwell – his craftiness, his political acumen, his unprecedented rise to power and his smartness in building a reputation, nobody expected from a blacksmith’s son. 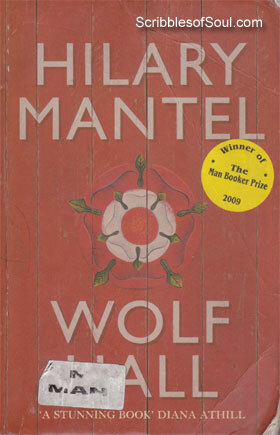 Hilary Mantel has succeeded in telling a well known historical event with her point of view. She rephrased the entire English History during 1529-1535 in her own way, looking at things from Cromwell’s eyes, painting every little event in his flamboyant colors, exposing his cunning charm and pure heart at the same time. I particulary liked the beginning, where a young boy is brutally beaten by his father, a cruel smith, who vents out all his frustration on his innocent lad. And, slowly but steadily this weakling grows up to be a street smart man, Thomas Cromwell, whom everyone at English Court would be afraid of. It was fun to look at the Tudor History through the eyes of Cromwell, interesting to find out his thoughts, which were actually buried with his mortal body more than 400 years ago. The author’s fertile imagination goes a long way in sketching the colorful portrait of one of History’s most mysterious character. However, the novel does have its shortcomings. I found its complicated third person narration a total let down. The dreams and real words of the characters were all mixed up, and sometimes I had to read the paraphrase twice to decipher the actual import. Moreover, Hilary uses the pronoun ‘He’ overzealously. Right from Cromwell to Henry to Wolsey to More, all are simply mentioned as ‘He’, even when all of them are present in the same conversation. I found it irritating to find out the actual narrator. Though, as I progressed, it became clear that, as the story is written from Cromwell’s point of view, predominantly, he is the one referred to as “He”. But, a better usage of syntax would have certainly made the novel less tiresome. Moreover, as it is a historical fiction, readers are supposed to be well versed with the history tackled in the present story, and in absence of facts, you would find yourself at cross seas, unable to understand the intricacies of conversation, and the sarcasm hidden in the plain sentences. Though, Hilary did try to give some facts in her novel, but it is eminent to have a preliminary knowledge of History to enjoy the novel in toto. I think, clearer narration would have dissipated most of the doubts, but sadly it is lacking in the present book. But, despite these slight aberrations, I found the novel quite absorbing. It was a novel experience, as it laid bare the customs, food and social structure of those times. Reading about a Nation’s History in bland words may be boring, but clothe it in the fanciful garb of fiction, and every character becomes as alive as the man sitting next to you. This is the strength of a historical fiction, and I found Wolf Hall to be at least half successful. Last, but certainly not the least, the title is an unusual one. I kept wondering what Wolf Hall signified. Whether it was the falling English Throne, the dilapidated Parliament or the confused Church or the malleable Courts, as everywhere ‘man was wolf to man’, ready to gobble him alive. However, as I reached the end of the novel, surprisingly, Wolf Hall turned out to be a sweetened version of hope, the abode of Jane Semour, where the man of thunderous patience and voluminous ingenuity, Thomas Cromwell, would at last find some comfort, a feather bed to rest his thorn laden soul! I really loved this transgression from negative to positive, completing the whole circle of life. It elevated the status of this Man Booker prize winner for me. Indeed, it is a worthy read, provided you have truckloads of patience and time!